Focus on the food: The cornerstone to a foundation of health! In a desire to make our population healthier the US government conducted the HANES study (Health and Nutrition Examination Survey) to understand how people view the importance of a balanced diet and good nutrition. The study showed that the dietary choices made contained not just below average amounts of nutrients, but were composed of very poor choices and the average American’s diet is woefully lacking in nutritional value. In 1989, the US Surgeon General released a report he called “Nutrition and Health”, this report showed diet and lifestyle choices were linked to two thirds of deaths in the US. In addition to poor dietary habits, our systems are also dealing with environmental pollutants. Our skin and lungs deal with a daily onslaught of chemicals and by providing our body with nutrient rich food, we can help strengthen our systems and work to minimize the damage. Now that we have your attention, here are some ways to take the next step in health. EAT PLENTY OF FRUITS & VEGETABLES: What does “plenty” mean? According to Havard’s School of Health, the average American gets less than three (3) servings of fruit and vegetables a day. However, dietary guidelines call for five to thirteen servings daily (2½ to 6½ cups per day), depending on one’s caloric intake. For a person who needs 2,000 calories a day to maintain weight and health, this translates into nine servings or 4½ cups per day (2 cups of fruit and 2½ cups of vegetables). Consume fruits and vegetables as close to their original state as possible. As you boil, fry, saute and bake – food’s enzymatic activity is lost. ADD FISH TO YOUR WEEKLY MENU: Eat at least 1-2 servings of fish each week. Each serving constitutes 3.5 ounces cooked, or ¾ cup flaked fish. And we don’t recommend just any fish, but the type that contains high amounts of omega-3s, such as: salmon, mackerel, herring, lake trout, sardines and albacore tuna. Unlike most red-meat choices, the fish recommendations listed above are not high in saturated fats. They do however contain the omega-3s which research has shown decreases the risk of arrhythmia’s, triglyceride levels, slows the growth of arterial plaque and can help to lower blood pressure. GET RID OF THE TABLE SALT: Salt is an essential nutrient. However, we are not referring to table salt! Today’s table salt has nothing in common with natural, unrefined sea salt, which contain many essential nutrients. Believe it or not, this is the salt that once sold for its weight in gold. Unrefined sea salt is loaded with trace minerals, and is perhaps the most nutritious food on the planet. Table salt, on the other hand, leads the list of the most dangerous foods we consume, and the Western diet includes a lot of it! Table salt is bleached, de-mineralized sodium chloride. With the exception of added iodine, table salt has no nutritional value, but we sure are eager to add plenty of it to our food. Some of the benefits of unrefined sea salt include: stimulation of saliva (an important enzymatic activity), the balancing and replenishing of the body’s electrolytes, providing high resistance to infections and bacterial diseases, helps to balance alkaline/acid levels, helps to restore good digestion, greatly helps to reduce toxins in the body, and unrefined sea salt can supply up to 82 trace minerals vital to cellular maintenance! If you do decide to switch to unrefined sea salt, ensure you consume proper levels of iodine, as per your healthcare provider’s instructions. This is because unrefined sea salt may not contain the necessary amounts of iodine needed to prevent iodine deficiency diseases. Table salt (sodium chloride) is artificially enhanced with this mineral. DRINK WATER: It might be everywhere, but one should never take water for granted. Water makes up more than two thirds of human body weight, and without water, we would die in a few days. The human brain is made up of 95% water, blood is 82% water and lungs 90% water. A mere 2% drop in our body’s water supply can trigger signs of dehydration: fuzzy short-term memory, headaches, trouble with basic math, and difficulty focusing on smaller print, such as a computer screen. (Are you having trouble reading this? Drink up!) In fact, the main cause of fatigue throughout the day is dehydration. Though everyone’s needs differ, the rule of thumb is to either drink half your body weight in ounces or drink at least eight 8-ounce glasses of water a day. Eight ounces = one measuring cup. An easy way to gauge your hydration levels is to simply look at your urine. It should be fairly clear. If it is dark yellow this is likely sign that we need to drink more water. MULTI-VITAMIN SUPPLEMENTS: Support your diet and and health potential by taking a comprehensive multi-vitamin & mineral supplement. Remember, when choosing a supplement, quality is very important. Be very cautious! You definitely don’t want to, but often times you will receive: extra fillers, lead, artificial flavorings and preservatives. These additives are part of many, easily obtained, over-the-counter vitamins. Click here for our #1 Selling Multi-Vitamin! QUIT PROCESSED FOODS AND SUGAR: Work towards removing of all processed foods and sugar from your diet. But, let’s face it – most of us are going to slip now and then. The goal is to begin the process each day. The more you do, the more you will notice that your desire for processed foods and sugar decrease. Remember, healthy choices start in our kitchen. Taking the time to plan ahead will help you make healthy choices. Choices that will improve your health for a lifetime. 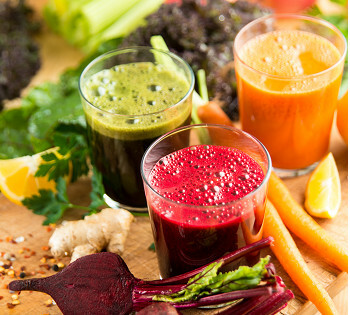 Increase your fruits and vegetables: Nine servings in combination (2 cups of fruit and 2½ cups of vegetables) daily. One (1) serving equals approximately ½ cup. Fish: Eat at least 1-2 servings of fish each week. Salt: Substitute table salt for unrefined sea salt. Speak with your healthcare practitioner beforehand to insure the proper amount of iodine is consumed daily. Drink water: Drink at least 8 eight-ounces (i.e., 1 measured cup equals eight ounces) per day. Moderate exercise: 30 minutes 3-5x/week. An advanced performance, multi-nutrient supplement providing exceptional broad-spectrum nutritional support. Utilizing some of the most highly recognized antioxidants, nutrients, and botanicals. 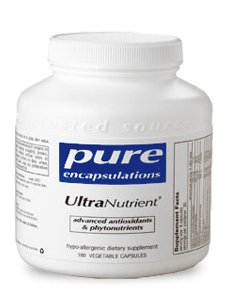 UltraNutrient enhances Nutrient 950 with alpha lipoic acid, coenzyme Q10, and reduced glutathione, as well as standardized extracts of hawthorn, ginger, milk thistle and turmeric. What does “plenty” mean? According to Havard’s School of Health, the average American gets less than three (3) servings of fruit and vegetables a day. However, dietary guidelines call for five to thirteen servings daily (2½ to 6½ cups per day), depending on one’s caloric intake. For a person who needs 2,000 calories a day to maintain weight and health, this translates into nine servings or 4½ cups per day (2 cups of fruit and 2½ cups of vegetables). Consume fruits and vegetables as close to their original state as possible. Salt is an essential nutrient. However, we are not referring to table salt. Today’s table salt has nothing in common with natural, unrefined sea salt, which contain many essential nutrients. Salt is perhaps the most nutritious food on the planet. Table salt, on the other hand, leads the list of the most dangerous foods we consume. With the exception of added iodine, table salt has no nutritional value! It might be everywhere, but one should never take water for granted. Water makes up more than two thirds of human body weight, and without water, we would die in just a few days. The human brain is made up of 95% water, blood is 82% water and lungs 90% water. The rule of thumb is to either drink half your body weight in ounces or drink at least eight 8-ounce glasses of water a day. Eight ounces = one measuring cup. According to Science Daily, “moderately strenuous exercise, about 30 minutes 3-5x/week, can lead to enormous benefits in terms of your mood, health, weight and the ability to live an independent and fulfilling life. Work towards removing of all processed foods and sugar from your diet. But, let’s face it – most of us are going to slip now and then. The goal is to begin the process each day. The more you do, the more you will notice that your desire for processed foods and sugar decrease.